Int Eighty and c64, collectively known as Dual Core, have just released their latest album effort. Dedicated to both super villains and super heroes. 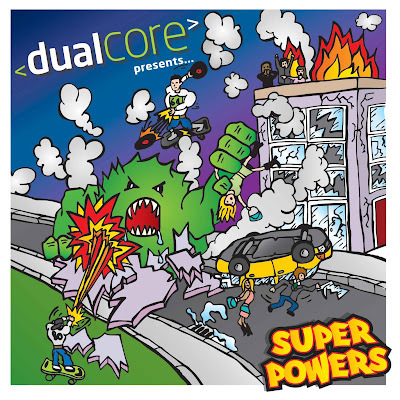 Dual Core along with guest songs by YTCracker, Beefy, ZeaLouS1, and MC Wreckshin travel through 12 songs looking at heroes and villains from many different perspectives. I've been listening to this album pretty much nonstop since Int Eighty sent it over to me. It's an amazing album for anyone who enjoys nerdcore hip hop. We'll try to go through this track by track to allow me to explain the diversity in this album. The first track is called Super Powers Theme Tune, and is, appropriately enough, the albums introduction. Coming in at the second longest track on the album, it paints a great picture of how it would be if super heroes got together for a big video game tournament. This song sets up the album very well, and drops a ton of super hero names, as well as video games. The second song on Super Powers comes courtesy of Beefy. The track, I'm No Superman, speaks about Beefy being "no Superman" but still a hero to some. An uplifting track that has an interesting acoustic country style sound running through it. Next up is another song by Dual Core, this time about the heroes, toys, cartoons, and more from the 80s. Another great catchy song, especially for those who actually did have a childhood in the 1980's. Another guest track is after this. One of my two favorite tracks on the album, Super Super Hero by YTCracker. The song goes by too fast, but is very great while it lasts, with YTCracker namedropping a ton of comic book heroes and villains. The namedropping comes along with why YTCracker is more awesome than any of them. This song also features some awesome beats. The next track is where the album takes a very interesting turn, and starts to look at super heroes and villains from different perspectives. The song Shadows looks at two spies trying to take each other out. Next up is another guest track called The King. This time from the great ZeaLouS1. He states that his track is about "a super hero I know." This is another amazing song, looking at what heroes really are, and I give major props to z1 for making this track. Orbit is a track about a new super hero going by the name c64. It's a stellar track about being a hero and doing the right thing, as c64 easily does in the song. Day's Work is about a slightly less amazing new hero Int Eighty, who regales you with a day in his life as a super hero. This is another one of my favorite tracks on the album, and has a great beat that you wouldn't imagine would work with a song like this. But the beat easily works in the hands of Dual Core. The final guest track, The Choice, comes courtesy of MC Wreckshin, and is told through the perspective of a villain seeing the error in his ways after it's too late. The song is on the short side but uses an interesting beat that sounds like it would be in a 1940's newsreel, but he works with it quite well. The final three tracks all come from Dual Core. In Cahoots is a great song that will make you think twice about all your favorite super heroes, and how just they really are. It's another fantastic track that shows things from a very different perspective. What happens when the super heroes fail. That's what the track End of the World discusses. It's a slower track and a great way to end the album. The final track, Just Made Up, has the feel of a bonus track, and is by far the longest track on the album. It's a song that establishes Dual Core's Int Eighty as a crafty and amazing freestyle rapper, along with Odub, another amazing freestyler. Super Powers is definitely a solid album from beginning to end. Incredibly diverse in music, flows, and perspectives. It is well worth the price of admission, and I'm sure that most everyone will find a favorite song on it. The contributors also bring a lot to the album. The production value on Super Powers, much like Dual Core's Zero One, is through the roof. Dual Core certainly outdo themselves again on this release. I'd say this album is a definite buy, but would we really expect anything less from Dual Core? You can head over to Dual Core's site dualcoremusic.com to purchase the album for $10. Also, if you have already purchased Zero One from Dual Core, you can grab Super Powers for $5. And if you buy both Super Powers and Zero One together, you get them both for $15!